Patricia PacJac Carroll here again. Jacs, my wonder dog, and I are going to talk FLOWER POWER. I know you all are thinking hippies and 60s and 70s, but I'm going back in history. Right Jacs? 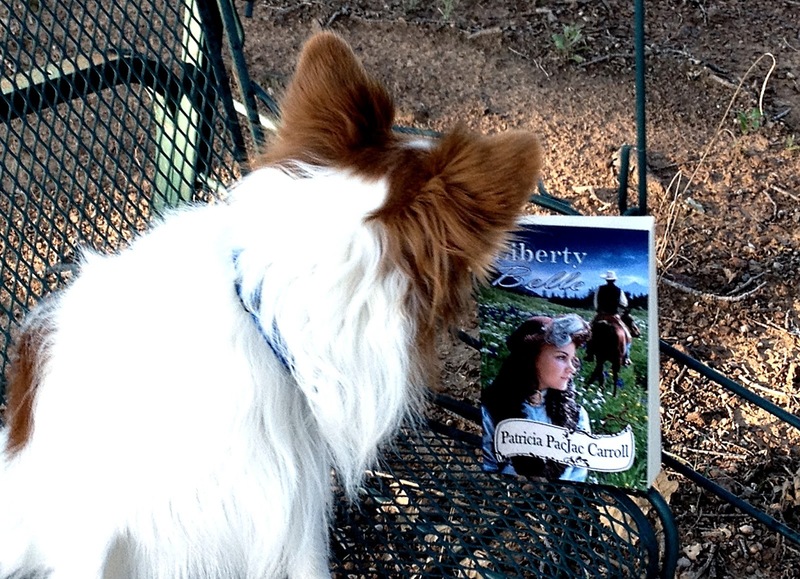 Oh well, Jacs is beating the heat of August and reading my book, Liberty Belle. Since my oncologist is in Fort Worth, and we were waiting for an appointment, my husband and I took a trip to the Fort Worth Botanic Gardens. I was surprised to see that the WPA of President Franklin Roosevelt was used to create the rose gardens. The sign reads -Beauty out of Adversity. How cool is that! And how beautiful for us to enjoy. What a wonderful legacy. They understood the need for people to work as well as the need for people to have a place to go and admire flowers. We have flowers alongside our highways thanks to Lady Bird Johnson. Lady Bird Johnson encouraged her husband to pass a bill to beautify the nation's cities and highways. The Highway Beautification Act was informally known as Lady Bird's Bill. "Ugliness is so grim, a little beauty, something that is lovely, I think, can help create harmony which will lessen tensions." Almira Lincoln Phelps wrote a book in 1829 titled Familiar Lectures on Botany. < amazingly it is available on Amazon. She believed the study of botany was perfect for women as they enjoyed the investigation of the beautiful and the exercise would do them good. She later included the Symbolical language of flowers in her book which dated to at least the times of Shakespeare. Who doesn't enjoy a gift of flowers? Their colorful beauty brightens any day. The women of this century could learn from this. Let's get out there and see how many different flowers we can find, enjoy, and admire. Update: I am doing great! Had my last chemo yesterday and am confidant the cancer has been killed. Thanks for all the encouragement and prayers. See you again September 13. Not complaining, It's a cool cut for the summer. Great post on flowers! Magic lilies are my favorite flowers. Sally, I had to google Magic Lillies to see what they looked like. Beautiful. I can see why they are your favorite. I never knew what they were. They would just magically appear sometimes during the summer. Come to find out, my husband's grandmother had planted them many, many years ago. Now I look for them every summer. This summer, with all the rain, we've had, they came up in two places! One place I'd never seen them before. One day they aren't there, the next they are in full bloom. Magic! And what a legacy your husband's grandmother left. That makes them even more special. We have roses, geraniums, Gerbera daisies, Plumeria, magnolias and gardenias in our yard. Thank you Martha, glad to get that stuff over with But more glad that the Lord has been so good to me. : ) I don't have a favorite flower, too many to chose from. I do love pansy and daisies and dandelions. and Bluebonnets just so many beautiful flowers. What a wonderful post- beautiful words and beautiful pictures! I enjoy sunflowers, especially seeing them growing in large fields. They always make me smile! Wonderful news about your last chemo! Praying for your continued recovery. I love sunflowers too. They do make you smile. Flower power at its best! And thank you for your prayers. I know they make a difference. I love hydrangeas, I live in wisconsin and having problems getting mine to bloom! I think even looking at your pictures you posted that flowers have a healing and soothing effect on me!!! I love hydrangeas, especially when they are blue. I agree, flowers are so beautiful and different and look happy to me.